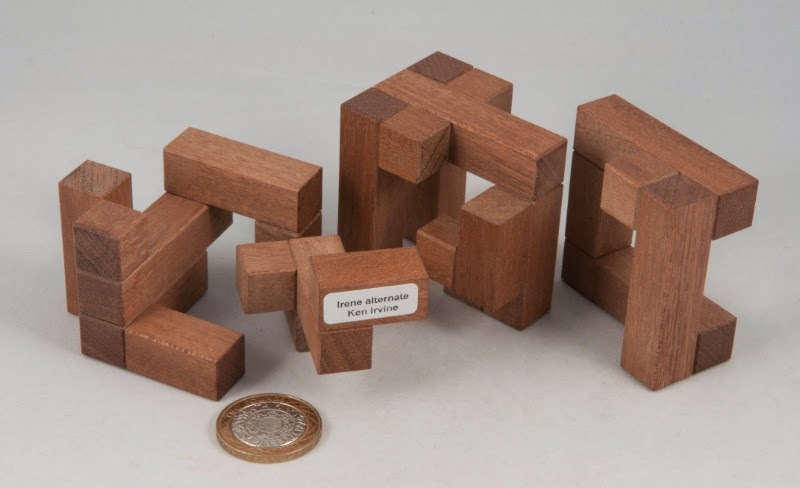 After my last blog post about Ken Irvine’s great designs, Bernhard Schweitzer let me know that we had a couple of new TICs (Turning Interlocking Cubes – Bernhard’s term) coming available, so I duly put in the obligatory order and a couple of days later a well-protected set of three new TICs arrived - two designed by Ken Irvine and a third by William Hu (he of first-base-fame?). Irene Alternate is another of Ken’s 4*4*4 cubes that consists of just 4 pieces … which require “only” 8 moves (by my count) to fully disassemble, but it’s a really tricky little so-and-so. Finding the first move is a bit tricky, the second move comes reasonably easily from there, but the third move is a right little sod and I only found it by a series of eliminations and deducing that there was nothing else that could happen, so it had to be that particular move, and it still wasn’t simple. You see, the tolerances on this cube (presumably from the New Pelikan Workshop guys) is fantastic, so there are no clues along the way and the moves only work if things are aligned properly. 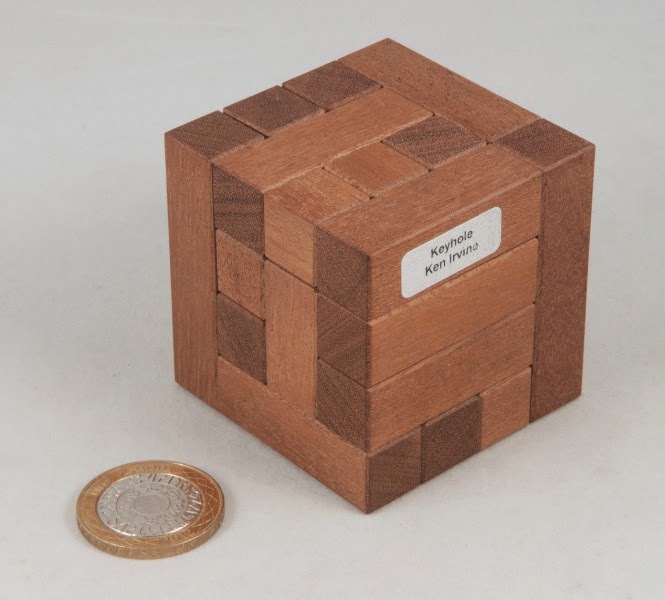 Even with only four pieces, reassembling this cube is anything but trivial – you can work out how the pieces need to sit in their eventual solved shape, but getting them there will need some creative thinking. Five moves to remove the first piece, and then they come apart pretty regularly from there onwards. The first few moves are bit tricky, but once you’ve removed the first piece, it’s pretty much downhill from there … and once again, as you’d expect from Ken’s designs, getting them back together is a grand little challenge – especially since my favourite piece of puzzling software can’t help much along the way. Two-Wheeled Cube is my first design from the Australian designer, William Hu. This one is particularly fiendish – it lulls you into a false sense of security because things seem reasonably straight-forward to start with – four pieces come out just like that, leaving you with a pair of interlocked wheels. …and unless you paid very close attention to the orientation of those two wheels, you’re in for one heck of a challenge – getting them back into the right orientation so they’ll receive the remaining pieces is a pretty stiff challenge… trust me! Three great TICs – thanks Bernhard! 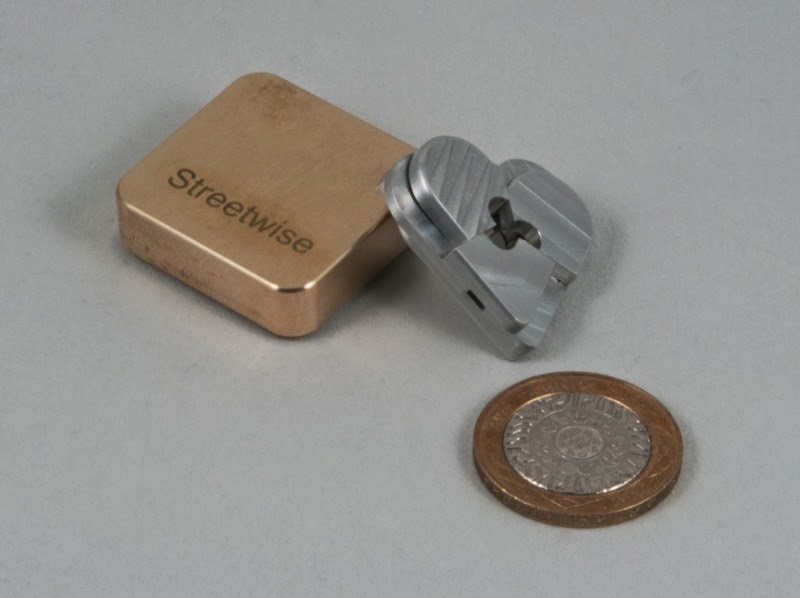 A little while back Wil Strijbos’ latest email newsletter dropped into my inbox and I spotted a couple of new machined aluminium items that looked rather interesting, so I did the obvious thing and pretty soon I had a copy of each on my desk. Four-piece Jigsaw Puzzle is Wil’s version of the old classic. Thinkfun have been selling a purple plastic version for years (I remember buying a copy from Hamleys several years ago!) and there are several wooden variations out there – some with rather interesting shapes to them. Wil’s version is the classic square shape that looks like a simple four-piece jigsaw puzzle – how hard could it possibly be? Well, if you haven’t seen these before you’re likely to pick them up and expect the pieces to simply fall apart – except they don’t! Something seems to keep them from coming apart, and until you spot some rather subtle (very subtle on this version!) clues, you’re unlikely to get the pieces apart. You definitely won't solve this version by accident! 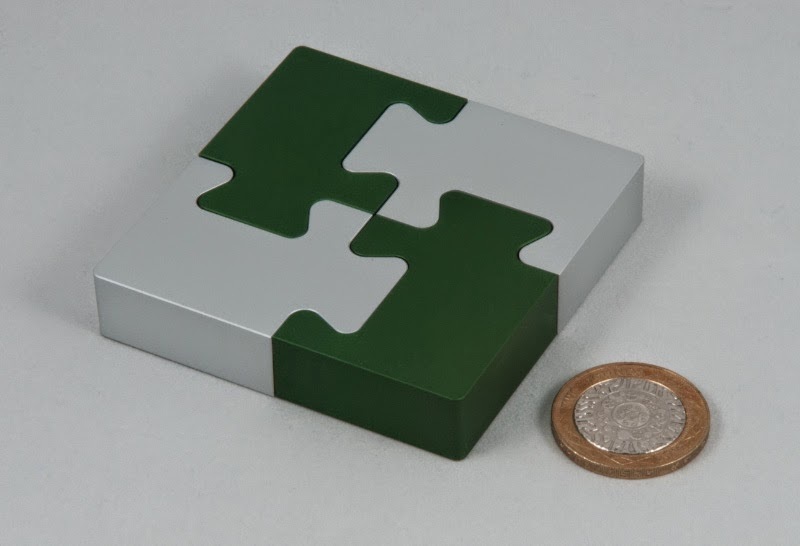 The pieces are all solid aluminium and the fit is absolutely perfect – which makes spotting the trick nice and tough initially, and then executing the required moves very tricky – there’s literally no margin for error at all… a really great version of a classic puzzle – brilliant for amusing muggles! 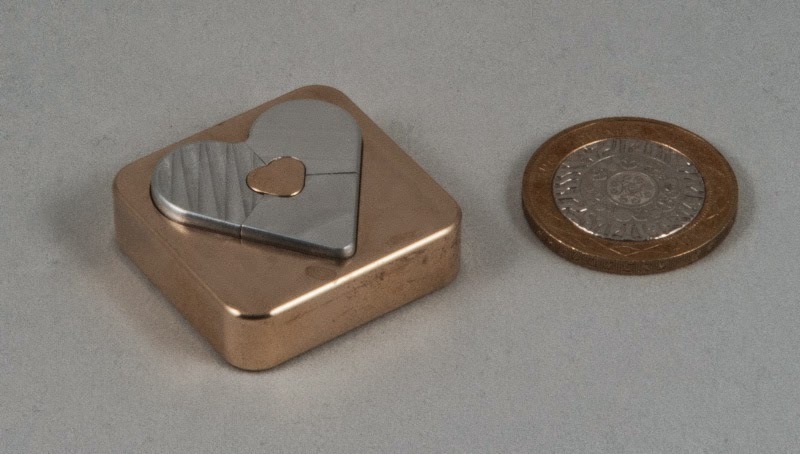 Heart in Heart is a cute little puzzle consisting of a three-piece aluminium puzzle resting in a rather neat little machined brass base. Take the puzzle off the base and you’re faced with what may be a familiar sort of mechanism, albeit in a rather different shape. Ring-shaped versions of the mechanism have been around for a while. Wil had had a couple of samples made up a few years back and I was lucky enough to snag one of them – it took me ages to get it apart the first time, and then even longer to get back together again… it doesn’t take quite so long now, but it’s still incredibly finicky – especially starting it off on the reassembly. The heart-shape gets around this rather neatly due to its shape, so it’s a lot more fun to reassemble than the ring-version… things are a lot less critical in the early stages. 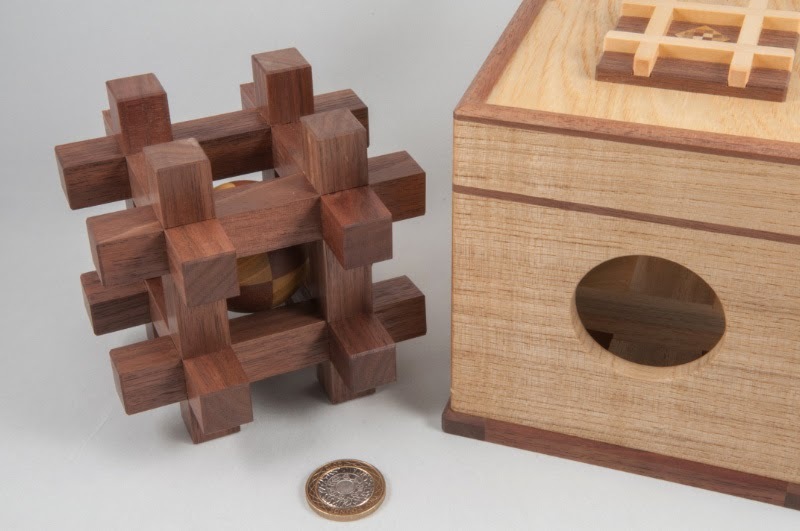 Having said that, if you aren’t familiar with the concept, it might still take you a while to work out how the heck to take it apart – careful examination helps, but then your fingers will need to do things that the puzzle is specifically designed to make rather tricky – cute little puzzle that looks really good. When Iwahiro interviewed Yoshiyuki Ninomiya back in 2006 for an article in CFF (recently published in CFF #92), he’d been crafting wooden masterpieces for 61 years. 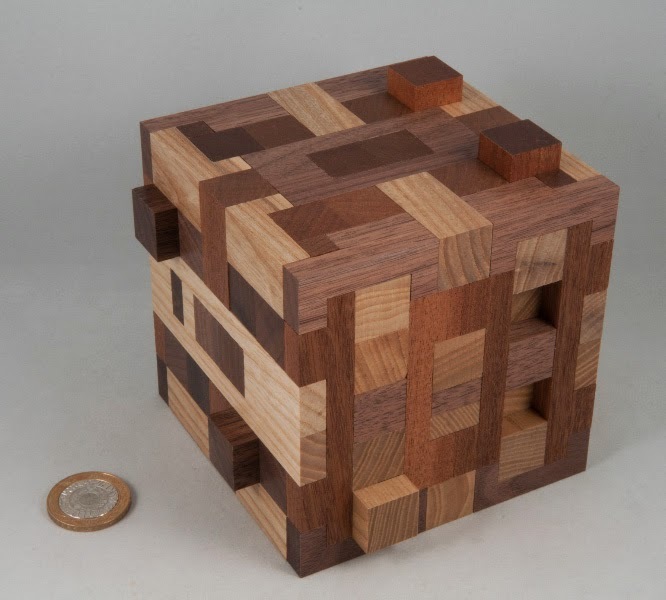 And he’s still creating highly desirable puzzles for admirers and collectors around the world today. Whenever the Karakuri Club offers anything by Ninomiya, it’s only ever done as a lottery because they know it’ll be massively over-subscribed and the only way to ensure fairness is to randomly select lucky punters from those who’re interested in acquiring the latest piece… I’ve put my name down for them a few times and never been lucky. 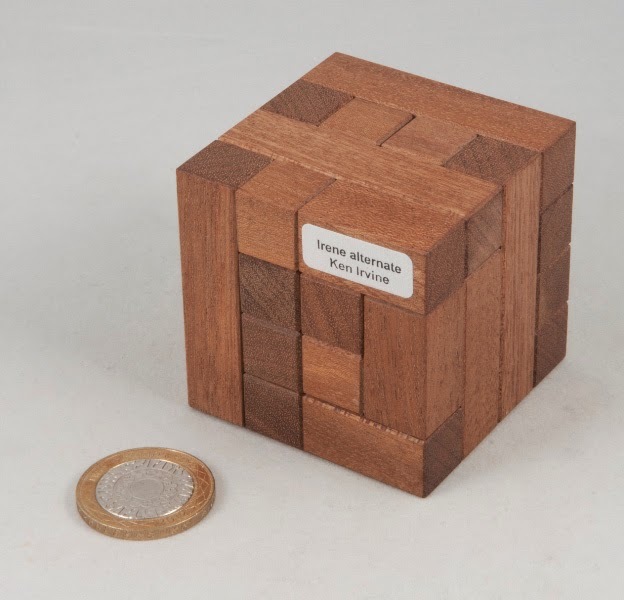 A short while ago my puzzle-supplier-in-chief got in touch and asked if I’d be interested in buying a new Ninomiya puzzle – my reaction was pretty predictable and a few days later I was opening a huge box from the Netherlands. There were a couple of little things and then the main event: a rather large puzzle box with a caged ball peeking out through round holes in the sides of the box. 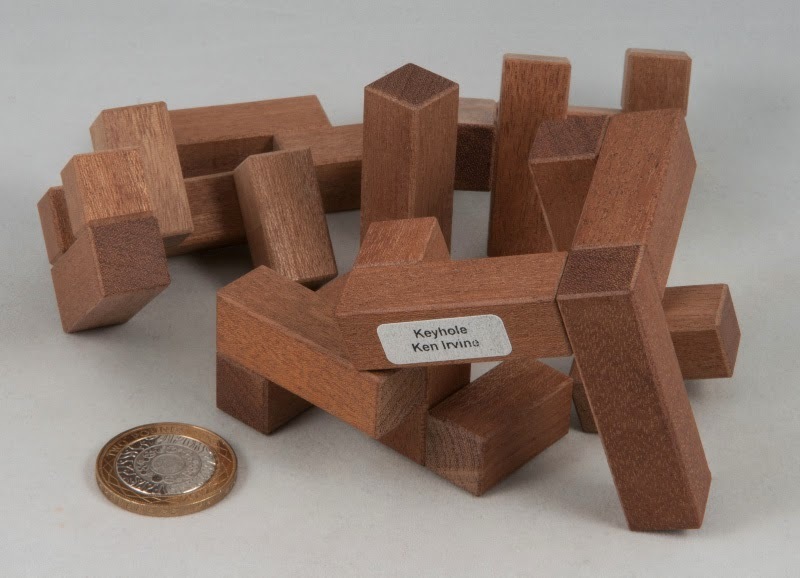 I think that the puzzle had been created for a special Karakuri exhibition last year and there weren’t a lot of them around, so felt very chuffed to have been offered this particular copy. Initial impressions are that this isn’t a small puzzle – petite she ain’t! You can tell form the fact that my trusty two pound coin looks pretty insignificant next to this one. First order of business is to find you way into the box – it’s non-trivial, but not super difficult – and there’s a nice unusual bit in there that you might not be expecting. Take the lid off and you’re left with the burr cage with its trapped ball standing neatly on the base of the box. The burr cage is the standard design that we’ve all seen a hundred times, but the execution is incredible. There’s no sloppiness whatsoever. Until you try doing the right thing, there’s no give at all. Try the right movements and it’s as smooth as butter. 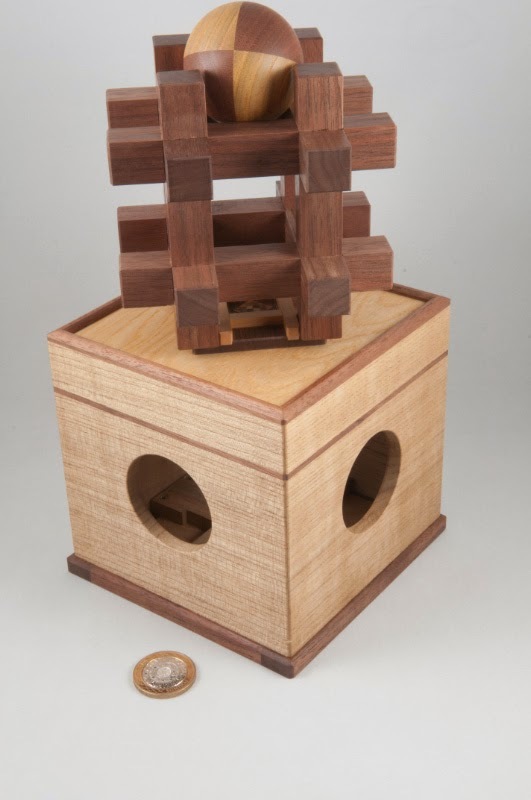 Disassemble the cage and the perfectly round wooden ball is released – the goal of the puzzle… but you’ll probably want to spend some more time just playing around with the burr cage, even though you know exactly how it works because the fit is just so perfect and the locking is spot on. 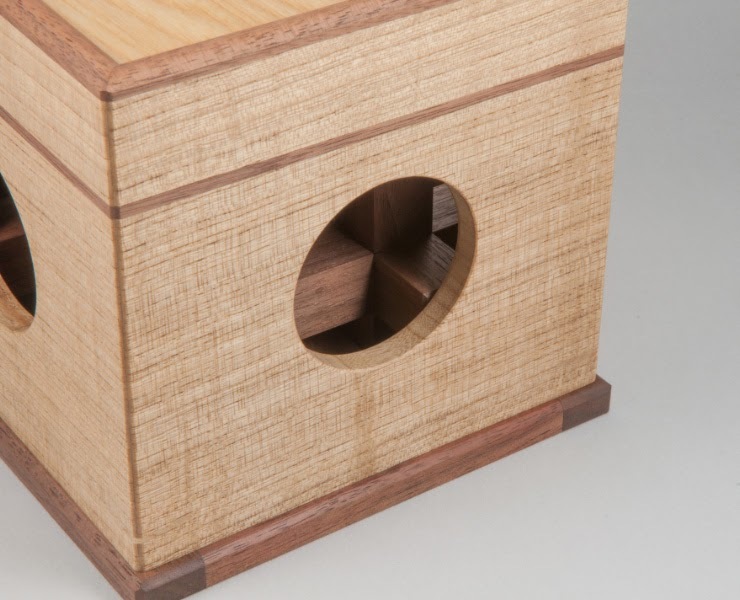 One of the neat little extra details is that bit of decoration on the top of the box – it’s actually a little turntable with a stand on it for the burr cage – so you can display it on top of the pedestal at an angle so it looks at its best. 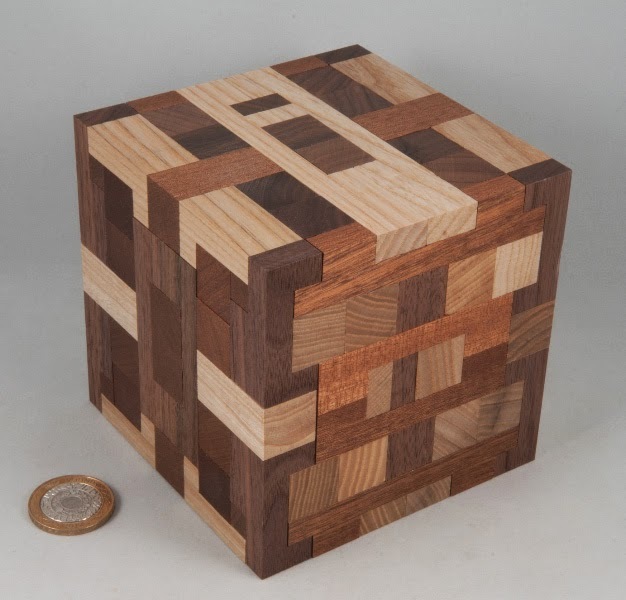 My first Ninomiya piece isn’t a traditional Ninomiya puzzle box – but it’s rather unusual and still manages to show off his incredible skill as a craftsman – well into his eighties. It’s not hard to see why his work has such an incredible international following – it really is something special! 11 moves to get the first piece out. Just think about that – Bill designed this in his teens, by hand – and it’s still a classic 50 years later… little wonder he went on to become one of the best known designers around! 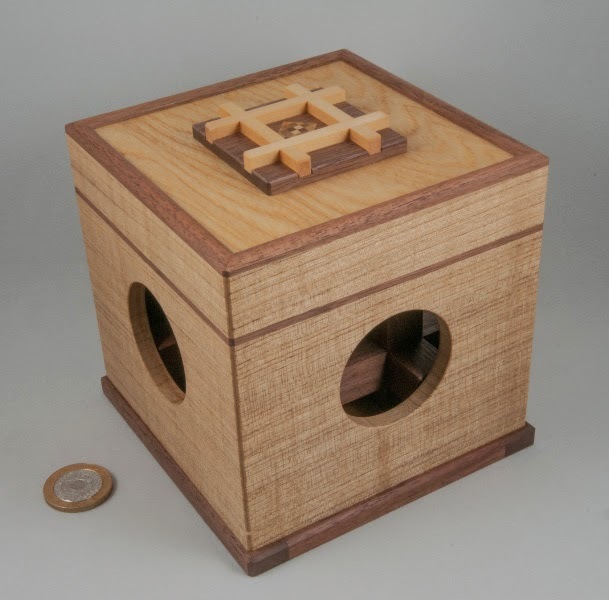 Bill describes the Cube as being made up of two main structures – an inner cage consisting of a standard 24-piece burr (picture 8 inter-connected 6-piece burrs at the corners of an imaginary cube; and an outer shell consisting of another 41 pieces. The two structures are locked together using a key-piece … one that takes 11 moves to remove (so not a key-piece in that sense!). 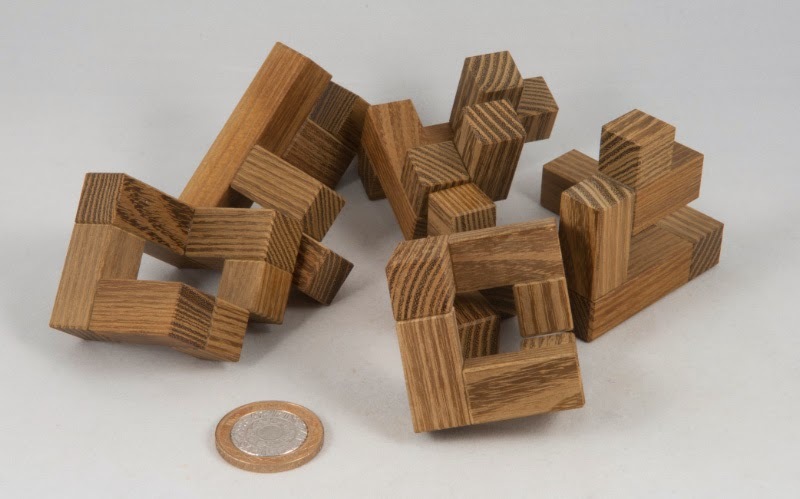 When Eric Fuller announced back in January that he’d been given permission to make a run of Cutler Cubes I immediately signalled my interest – and followed the pics as the piles and piles of pieces grew in Eric’s workshop – sadly including a large pile of mis-cut pieces that got trashed because he’d used the wrong wood. In spite of the mishap along the way, Eric duly announced that he was done and was proud of the results – so I knew it would be awesome – Eric sets himself very high standards! I wasn’t disappointed when it arrived – it looks stunning! 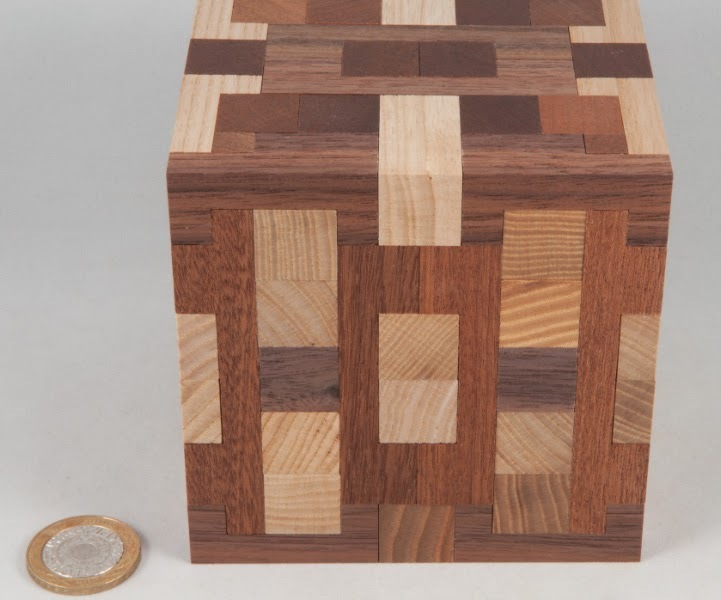 The original Cubes were made in walnut, oak and mahogany and Eric’s traded the latter two for ash and sapele – keeping the overall colour scheme and looks true to the original. Neat! The fit is definitely up to Eric’s usual standards … this is going to be brilliant! As soon as you start playing with it, you realise this isn’t going to be a walk in the park – you can find a few things to move … and that movement opens up yet more movement, but then you stop dead in your tracks. Bill’s designed a bunch of dead-ends and red herrings into this brute and I’ve been caught hook, line and sinker! I try a slightly more rigorous approach but still find myself wandering into the same blind alleys. Clearly this is going to need a serious approach, so I try putting on my puzzling hat and this time notice something “interesting” that I haven’t spotted before – it’s beautifully hidden – and then all of a sudden you know you ain’t in Kansas no more – something very unexpected happens – and that really sets the tone for the rest of the solve – you know you’re on the right track now – that’s fantastic! 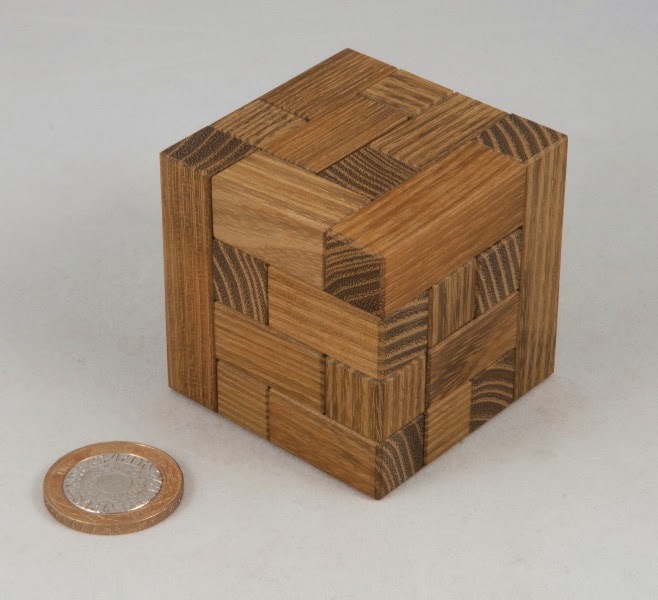 After that key-piece is removed, they start coming apart thick and fast until you find yourself left with that inner cage – the 24-piece burr at the centre of the Cube – even then it isn’t trivial. Faced with a pile of 60-odd pieces I do what every sensible puzzler would do, and drop Eric an email asking for the solution – it duly arrives along with a PDF of Bill Cutler’s original notes from 1980 – including drawings of the pieces and their positions, and quite helpfully, some additional construction notes from Eric on how he chooses to assemble them – after all he had to assemble a run of 38 of these brutes so he had to come up with a fairly repeatable process. Even with the benefit of all these pictures, notes and instructions, I still make heavy weather of it – having the partial assembly come tumbling down a few times before I managed to get enough interlocking-ness into the structure to keep things together and then finally manage to get it all back together again… serious sense of achievement ensues. Back in the 1960’s Bill Cutler set out to design a burr that was a challenge to take apart. Fifty years on I’d say he was pretty successful at doing that on his Cube. Eric has produced a fantastic version, true to the original with tremendous tolerances, brilliant fit and a lovely finish… an excellent puzzle to have in the collection.